4.1.2.1 Lazarus 0.9.30 on Mandriva 2010. A real "in depth" build guide is here. For people who simply want to install Lazarus and start using it for programming, the easiest approach is to download and install a recent, reasonably stable binary release (such as a Linux ".rpm" package, a Windows ".exe" installer, or a Mac OS X ".dmg" package). You can read the sections under Linux or Windows entitled "fpc binaries" or the first paragraphs in the sections on installing Lazarus in Linux or Windows; most of the remaining information can be safely ignored. For those who want to participate in the development of the compiler or the IDE, or for those who want the most up-to-date tools, an installation from source files is necessary, and much of the rest of this information is relevant. The native Win32 API can be used, or Qt widgetset. GTK+ 2.x or Qt : Most Linux distributions and *BSDs already install the GTK+ 2.x libraries. You can also find them at http://www.gtk.org. Qt is also supported with all distributions (auto installed if you prefer KDE). You need the Apple developer tools. See Installing under Mac OS X below. Qt can be used too. The FAQ - Frequently Asked Questions file is available at http://www.lazarus.freepascal.org . Some of the questions can be found in the local file 'FAQ'. Qt widget set is supported on Linux 32/64,Win32/64,Mac OS X, Haiku and embedded linux (qtopia) platforms. 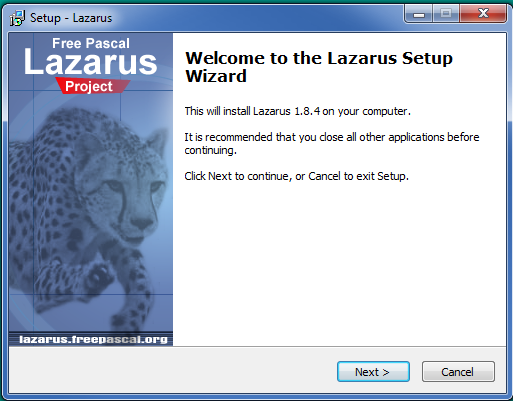 The following sections describe how to get Free Pascal and how to install Lazarus properly. While the remainder of this page has much valuable information, many users may need no more than the following "quick start guides" - perhaps ? By far the easist and most common way to install Lazarus on windows is to go to the Lazarus SourceForge download site, https://sourceforge.net/projects/lazarus/files/ select an appropriate combined FPC/Lazarus package, download and install. There is an extensive discussion of how to install and build Free Pascal compilers available here http://www.stack.nl/~marcov/buildfaq.pdf - it may be a little too detailed for some users, but is very comprehensive. Lazarus 1.4 requires fpc (Free Pascal) version 2.6.4 or higher and it requires both the compiled fpc libs (binaries) and the fpc sources and of the same version. The latest release of Free Pascal, version 3.0.2, can be obtained from the Free Pascal website (http://www.freepascal.org/download.var, then choose a mirror) or from SourceForge (http://sourceforge.net/projects/lazarus). At the Lazarus downloads section (http://www.lazarus.freepascal.org ) you can get the RPM or DEB of the Free Pascal compiler (compiler / Linux) and its packages. If you don't have an RPM-based or debian-based distribution, you can download and install the tarballs from http://www.freepascal.org. If you want to compile the binaries for yourself, see the BSD section. Warning: if you're not using RPMs or debian packages (even if you plan to use alien) it's best to get latest stable fpc (3.0.2 as of now) and install Lazarus from source. Start Linux and login as root. Debian users are recommended to use the deb packages, but may use either alien (warning, it doesn't generate fpc.cfg) or the tarball install. FPC source files are stored in a Subversion (SVN) repository that keeps track of all changes of the source tree. Once you have the sources, please see #Installing Free Pascal from source under Linux/BSD for instructions on how to install them. As an alternative to the daily zip files of the SVN sources, the SVN repository has been made accessible for everyone, with read-only access. This means that you can directly access the code, and you will have really the last-minute sources available. It is also a method which requires less bandwidth once you have done the first download (checkout in SVN lingo). How to do this? First, you need to have an SVN client installed. Use your package manager, install a tool like TortoiseSVN on Windows, or look at  for more details. If the current trunk version is in a state of rapid change and unsuitable for much use unless you want to work on the compiler itself, you can stay on a version that is updated with fixes. To do this, you have to find out a stable branch that you want to track instead of the default trunk development version. The example below shows how you can track the fixes_2_6 version; of course replace as needed depending on what branches you want to track. If you want to learn more about subversion, read this excellent Subversion book which is also available online in different formats for free. For more information, see the Free Pascal website. By far the easiest way to get a working installation of Free Pascal is to download the current binary Windows release of Lazarus from the SourceForge repository  - the release contains the current versions of the Free Pascal Compiler and the Free Pascal libraries as well as the Lazarus IDE. If you want to install from sources, read on! You can get the installer zip for fpc at Free Pascal's download section (http://www.freepascal.org/download.var, then choose a mirror). Installing from the sources -- see the next section to know how to get them -- is not for novices, since you need a starting compiler as well. The easiest way to get the Free Pascal sources is via SVN; see the next section for more on that. You can also download the package as a whole -- see http://www.freepascal.org/develop.var for the daily snapshot of the 2.5.x release tree. You will need to have a SVN client such as TortoiseSVN installed in order to perform the steps below. The exact commands vary between SVN clients; the ones given below are to be used under SVN home's client, which is available for download here. See: http://www.freepascal.org/down/i386/win32.var . Download FPC as one big file, unzip it and run the install.exe. WinXP/2k: My Computer (Right Click) -> Properties -> Advanced (Page) -> Environment Variables -> System Variables -> Edit "PATH", Add "C:\pp\bin\bin\win32" there. After you have FPC binaries installed you can build FPC source from subversion. Windows (7+) requires that an elevated user status command prompt be used. From the start menu for "Command Prompt" right click and select "Run as Administrator". YOUR-PREFIX is totally dependent on where you installed FPC to. At the time of this writing, the binaries are instructed to use a default location of "C:\FPC" and they were placed in "C:\FPC\2.6.4". Under Linux, the make install scripts were adjusted to create a new sub-folder IF the FPC version changed since last build. The Windows scripts do not. So if you know the sub-folder name ie. 3.1.1 you can specify that. However, since versions change frequently, it is recommended that you just select and maintain a single PREFIX with no respect for FPC versions. A good prefix is C:\FPC but you must also make sure that the C:\FPC\bin\i386-win32\ folder is added to your path environment variable (see above on how to set your path and change it from the binary version to the newly compiled one). In command Prompt navigate to the localized FPC source. ie.) type "cd c:\Developer\FPC"
To build FPC type "make all"
To overwrite existing FPC type "make install PREFIX=YOUR-PREFIX"
To install source type "make install sourceinstall PREFIX=YOUR-PREFIX"
make clean all OPT="-glw2 -Xg"
Tip: You only need to use this BAT at the first time. Then you can just build Lazarus using the menu Tools menu> Build Lazarus. Latest FreeBSD ports collection has 3.0.4 stable version in ports/lang/fpc. But they are scattered over 96 (!) packages and the source can be obtained from /usr/ports/distfiles/freepascal. This can be done as root. If you have a file with all FPC sources, or two (FPC and Lazarus): 1. e.g. for fpc ftp://ftp.freepascal.org/fpc/dist/Linux/separate/sources.tar preferably an export (no SVN/ dirs). 2. Lazarus source snapshot. Optionally test to see if ppc386 -i (or whatever compiler your architecture uses) gives output, else give a warning that user need to add $PREFIX/bin to his current path. Try to compiler a program with -viwn, and see if that gives errors. $THEPREFIX and $ETCDIR should be user configurable. Otherwise local installs aren't possible. BSDHIER=1 on all make commands forces BSD hierarchy conventions. It is recommended to use the fpcUP updater-installer for first time users of Lazarus, which installs fpc & Lazarus in one go into a single subdirectory structure ( ~/development ). A way to get a current working installation of Lazarus is to download the .deb files for Free Pascal and Lazarus from the SourceForge repository. Here is how: Getting Lazarus from our Ubuntu repository. Note that installing from the default Ubuntu sources will not install the Free Pascal Source Libraries - use the method above. Note: on Linux Ubuntu at least, the command to start Lazarus from a console is startlazarus. Else, if you installed it from a Debian package, you should have a Lazarus menu entry under Application/Programming. (Issue: there is an ambiguity with a program also called "lazarus" from a "tct" package available for Ubuntu). The next easiest way is to the RPMs for Free Pascal and Lazarus from the SourceForge repository. the Lazarus package (eg lazarus-1.4.4-0.i686.rpm). Raspbian is a custom version of Debian for the Raspberry Pi creditcard-size computer. See Lazarus on Raspberry Pi for details. Lazarus 0.9.30 on Mandriva 2010. Install as given lower down however on compiling a program you may get two error messages telling you that you are missing pixbuf 2.0 and lgtk-x11-2.0. to fix this install from the the software installer libdgk_pixbuf2.0_0-devel and libgtk+2.0_0-devel. There is no real difference from the slackware 12.2 or 12.0 version, therefore the procedure described below should work just as well. You have installed the compiler. You may want to recompile it or not, but in any case you will need to download the source code as it is required by the lazarus IDE. Now you have your own compiled version working. The version number is included in the folder name "fpc-2.4.2". This way I can keep many versions the the compiler source and eventually switch between them. WOW! You get a message: "Free Pascal sources not found". Just follow the instructions and indicate your Free Pascal Compiler source directory in the panel: "Environment->Options->Files". As explained earlier, on my computer this should point to "/usr/local/src/fpc-2.4.2". Note that when you change this folder, you should click on "Environment / Rescan_FPC_source_directory". Important: The lazarus rpm requires the gtk 2 version, not the version 1.2. Recent packages of Lazarus and Free Pascal are included in Fedora by default. See Install on Fedora on how to install them. Scientific Linux is an RPM-based distribution focussing on science and research. See Scientific Linux for details. If you prefer to install from source and compile the files yourself, follow these instructions. Because the whole lazarus stuff is installed into one directory, uninstall is very easy and you don't need to be root to install lazarus. You can get tgz files for fpc, fpcsrc and lazarus from the downloads section or you can download it directly via svn. Here is an example of installing 0.9.28 to Ubuntu 6.06. If you understand Linux commands and bash script, you can get what steps are needed. Just copy the script (change the version number when new version has been released), paste it into a text editor, and save it as something like "install_lazarus.sh". Give it execute permission, and run it in a console. Note: In this example, fpc is installed in /opt. So when prompted 'Install prefix', enter '/opt/fpc'. echo "Enter '/opt/fpc' when prompted 'Install prefix'"
Note: You have to manually set fpc-src path in the Environmental Options. Both the Lazarus and FPC source code reside in SVN/subversion repositories. SVN provides an easy way to update your sources by only downloading the changes. This is the recommended way and saves you a lot of time. A connection to the internet is needed for this, but you don't need to be root. Please note these instructions are for subversion, but there is also a Git mirror repository of Free Pascal Compiler and Lazarus: see Git mirror. You can also use git directly with the subversion server using git-svn link: see Lazarus git-svn. Lazarus does not need any special permissions, neither during installation nor at runtime. If you decide to use TortoiseSVN, remember to check "command line client tools" during its installation if you want Lazarus to show the SVN revision number in the About dialog. If fpc is installed correctly, the compilation should work without problems. If not, see FAQ. The IDE should start. If you started lazarus in a terminal, you can see some notes about missing settings. This is normal at first start. The IDE automatically tries to find out where the Free Pascal compiler and its sources are installed by searching in the most common directories. The 'FPC Source directory' should point to your fpc source directory. This directory normally ends with /fpc/ or /fpcsrc/ (e.g. /usr/src/fpcsrc or /home/username/freepascal/fpc) and contains directories like 'compiler', 'docs', 'fcl', 'rtl' and 'packages'. See here for the documentation about this dialog: IDE Options. You may have to append other options if for example you use a custom config directory (ie. add --pcp="C:\Documents and Settings\<USER>\Local Settings\Application Data\lazarus-tests"). See lazbuild. There are preliminary Debian packages for lazarus available for download. They are not the latest versions, however. Make sure you read /usr/share/doc/lazarus/README.Debian carefully before you start using it. Feedback is needed and appreciated; please send your comments to Carlos Laviola <claviola@debian.org>. without .deb extension. And then install the newest versions as described. The current releases of the Windows Lazarus binary packages install very easily, and should work 'out-of-the-box'. Upgrade is as simple as downloading the new installer and running. Except for Win98 and ME, which needs a special flag to compile. See Installing from source. It is even possible to install the whole Lazarus/FPC package on a portable USB drive (capacity at least 256 MB), for use in environments where you are not allowed to install software on your Windows workstation or where you haven't got administrator privileges. You do have to be a little careful about adjusting the paths in the compiler and environment options and the fpc.cfg file. It may also be necessary to keep the directory for test compilation on your portable drive. << Q:DOES ANYONE KNOW HOW TO SET UP RELATIVE PATHS IN THESE TAGS AND FILES, SO THAT THE ADDRESSING WORKS WHEN YOU MOVE THE USB DEVICE TO ANOTHER MACHINE WHERE IT HAS A DIFFERENT DRIVE LETTER? so that when I click on that link when the thumb drive folder is diplayed after inserting it, it will open a command prompt at the thumb drive with the environment variables set from setenv.bat. Download the latest release (currently Lazarus-0.9.30-0-win32.exe) and launch the application. You will be taken through a typical Windows installation, in which the FPC compiler and source libraries are installed within the same directory structure as Lazarus, and the IDE should launch and operate without significant problems, provided you have uninstalled(!!!) any previous version of Lazarus and/or FPC (often found in the C:\pp directory). You can also use a Lazarus Snapshot. For download locations see Lazarus Snapshots Downloads. Tip: It's perhaps a good idea to reboot your Windows after you installed Lazarus and before you try to install additional lazarus components as zeoslib fore example. If you prefer to install from sources, then follow these instructions. Please note these instructions are for SubVersion, but there is also a Git mirror repository of Free Pascal Compiler and Lazarus. See Git mirror for details. You can also use git directly with SubVersion server using git-svn link. See Lazarus git-svn for details. You have to download the lazarus source from one of the snapshots servers. Then unzip it to c:\lazarus for example [below called $(LazarusDir)]. You have to install at least the latests stable FPC version (e.g. FPC 2.6.4, but an FPC 3.1.1 snapshot is also possible). Win9x: use make OPT="-dWIN9XPLATFORM" (Lazarus trunk (and upcoming 1.4)) otherwise the lazarus.exe will not be able to run on this platform. If this works, you can type: lazarus.exe. An alternative version of the instructions above. Always start Lazarus from this shortcut, never directly from the executable. At the first time you start Lazarus configure you FPC dir, FPC sources dir and Lazarus dir. Because the Lazarus IDE by default links to a dll-call "CreateToolhelp32Snapshot", which does not exist on the Win9x platform, the IDE will not run on Win9x out of the box. In order to make it run you have to rebuild the IDE with "-dWIN9XPLATFORM". The following applies to FreeBSD 10+ only. The latest version of Lazarus available in the FreeBSD port tree, is v 2.0.0 We can use that to install Lazarus (GTK2 by default, QT4 or QT5). This option will often be used if you want to follow Lazarus Trunk, a Fixes branch, or some other release (eg: compiling from a source tarball). The readme.txt file in Lazarus directory mentions 'make clean all'. This works if you are using Linux. Under FreeBSD 9.1 I had to replace 'make' with 'gmake'. Note that you must install glib* port from /usr/port/devel/glib* or glib packages by pkg_add -r glib12 glib20. I will fix this in new PBI releases. Currently, there is no binary package to install Lazarus. You will have to compile Lazarus from sources. Please see Multiple Lazarus for details on having more than one Lazarus version installed on one system. We cover issues that can arise due to multiple Lazarus installs here, because they can also happen when installing over a previous version. These hints should (hopefully) be applicable across platforms; please adjust paths etc. according to your platform. Also, problems and solutions might be mentioned in the Lazarus_Faq. There may be multiple problems when installing Free Pascal and Lazarus. If you have problems with starting Lazarus or compiling with it, first make sure your underlying FPC installation works, e.g. by trying to compile a simple example program. On Linux/Unix/OSX, package/distribution provided installations will often install FPC in /bin or /usr/bin, with the libraries in /lib or /usr/lib, and probably the configuration in /etc/fpc.cfg Source (Subversion) downloads often install in /usr/local/bin (libraries in /usr/local/lib). If it is not present, FPC will in general not compile your programs properly. Note: earlier instructions had \bin\i386-win32 appended to the basepath. This is not needed since at least FPC 2.4.4. If the above doesn't work for you, you can copy/paste the code below to a new file named fpc.cfg to your fpc executable directory (or ~/.fpc.cfg or other location). Modify the paths so they match your situation. $FPCVERSION is used to automatically determine the version of FPC being used for the compile. Using this variable allows this single fpc.cfg to be used with multiple fpc versions that have the same path structure making it easier to maintain multiple FPC installs. #      -Sa        include assertion code. # -OoX       switch on optimalization X. # -OoNOX     switch off optimalization X. # -OpCPU     set target processor. You can also explicitly specify a fpc.cfg to use:<bash>fpc -n -@/path/to/fpc.cfg</bash>. Handy for testing, creating shortcuts/shell scripts, having multiple FPC installations etc. If that does not work, you can try to create fpc.cfg manually: copy over an existing fpc.cfg from a working installation and change the paths. If your FPC cannot find its sources/ppu files while fpc.cfg has the right paths, another cause could be that the fpc executable is a different version than the (link to) ppc<architecture> compiler. When compiling with fpc, fpc starts e.g ppc386 to compile for x86 targets. Please make sure fpc and ppc<architecture> are compiled by the same version/sourced from the same package. There may be a message saying Lazarus can't find the sources; if so, go to the menu at the top and select Environment -> Environment options and insert the name of the directory where you expect to find your lazarus files (eg ~/FreePascal/lazarus), your compiler (e.g. /usr/local/bin/ppc386), the Free Pascal source directory (e.g. /usr/local/lib/fpc/$version/fpc or a directory in your own space e.g. ~/FreePascal/fpc). Then close the dialog and start programming. Note that you can set paths (for compiler, FPC units etc) in the general options settings. Options you specify in Project Options can override these per project. If you experience path-related problems in a project but not in another, you might check if you mistakenly override general options. This page was last modified on 7 March 2019, at 19:32. This page has been accessed 233,855 times.